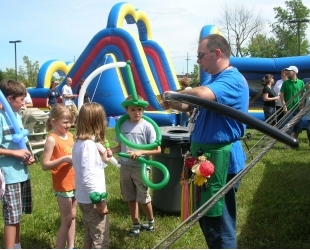 Last week, we celebrated the beginning of summer with a company barbecue and family fun day at RepairClinic.com. After all the downpours and extreme weather we were having in Michigan lately, we were all a bit nervous. But the morning was pleasant, sunny and dry. Perfect for a barbecue. The tent was already up when I arrived, and people were arranging tables and chairs. Two huge bouncies we had rented out for the afternoon fun with the kids were being inflated. I had stopped at the flower shop and picked up dozens of jewel colored African violets. Wrapped in green and white tissue paper they added charm and elegance to our gathering when I placed them on white tablecloths. The grills were being fired up on the side of our building, and Lisa, Ryan, Tracy, Shielda and Veronica were ready to start grilling when Raina arrived with the meat. Alana stopped at the bakery to pick up the desserts – an amazing selection of delectable little pastries, fruit tarts, chocolate brownies, carrot cake slices and napoleons. When employees started lining up at 12:30, everything was set up and ready. I placed a perfectly done piece of steak on my plate, potato salad on the side, and green salad with dried cherries. Prizes were given, employees recognized and Larry informed us on the progress of the latest projects and initiatives. I quietly listened as I tasted a delicate fruit tart with light cream and tangy kiwi and raspberries. After the employee luncheon, we started cleaning up and preparing for the arrival of our friends and families. The bouncies were ready. We brought out the food, the ice cream cart full of goodies, and lots of cold and refreshing drinks. The balloon guy was setting up when the first families arrived. Children lined up and I don’t think that guy got a break for a second the entire afternoon. We had two caricaturists doing portraits and each had a long list of patrons. Music was playing in one corner of the tent and children danced with full balloon headgear. Others were racing up the large bouncies, sliding down, then racing up again. People talked and some introduced new colleagues to their families. I visited with the little children and held the new babies. Everyone took pictures. No one wanted to go home at the end of the afternoon. Children asked their moms and dads if they could come again tomorrow. And, I don’t think I was the only one who slept like a baby that night.